When you’re a parent seeking to raise a bilingual child, it’s vital to be well-informed on the subject. The better informed you are, the better you’ll be able to effectively support your child’s bilingual upbringing. There are a number of books about children and bilingualism, but I think Raising a Bilingual Child is one of the best. 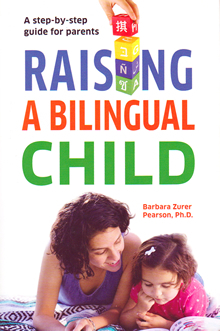 It was written by Barbara Zurer Pearson, Ph.D., an expert on bilingualism who has done extensive research on bilingual development. To me, the book stands out because the author not only provides plenty of helpful guidance, she backs up this advice with solid scientific findings. Other books I’ve read may offer similar suggestions, but Raising a Bilingual Child pursues a deeper discussion of these ideas and issues. At the same time, it’s not a scholarly tome. It’s very readable, and would no doubt prove useful and thought-provoking to every parent of a bilingual child. How about you? Have you read “Raising a Bilingual Child”? Or other books on bilingualism that have benefited you and your children? Her website: http://www.bilinguisme-conseil.com/ressources/ I am not sure if her latest book is available in English yet. Isabelle, thank you for the helpful tip. If I had taken French beyond high school, I would be very tempted to read the book—it sounds really interesting. I’d be eager to read an English version! Oh, Adam!!! So you read this book also and it was your first step, just like my case…what an amazing happy coincidence. Besides, since I re-read the book during my pregnancy, to pay closer attention and take notes, I gotta confess that I highlighted this part also, I think I wrote it in Spanish in my notebook and posted it on my Instagram account: https://www.instagram.com/p/BsYkrRjhz9j/. My second step will be to read your book and the third could be write my own book to inspire parents from Colombia—born and living here—to travel with confidence in this bilingual journey. Just fantasizing, so far, since I’m just at the very beginning of the adventure, but yeah…why not? Caro, I’ll be eager to hear your impressions of my book! And, yes, why not eventually write a book about your own experience, which could surely be helpful to others? It’s a lovely vision and I applaud your enthusiasm! Previous post: Don’t Stop Reading When They Start Reading!